This morning when I got up I was still feeling pretty rotten. It was a fitful night but as the morning wore on I started to feel better. We had to change hotels today because Francene traded some of her timeshare weeks and they require stays of a week at a time and we were setting off for a hotel closer in to town. So we packed our bags, checked out, and took a taxi to the new place which is a huge improvement, not as new and maybe not as nice but more comfortable and free internet access. We asked the cab driver to wait for us because we wanted to visit the cemetery after checking in because we knew our room wouldn't be ready. Today is Dia de los Muertos, a day when family and friends gather to remember the departed. 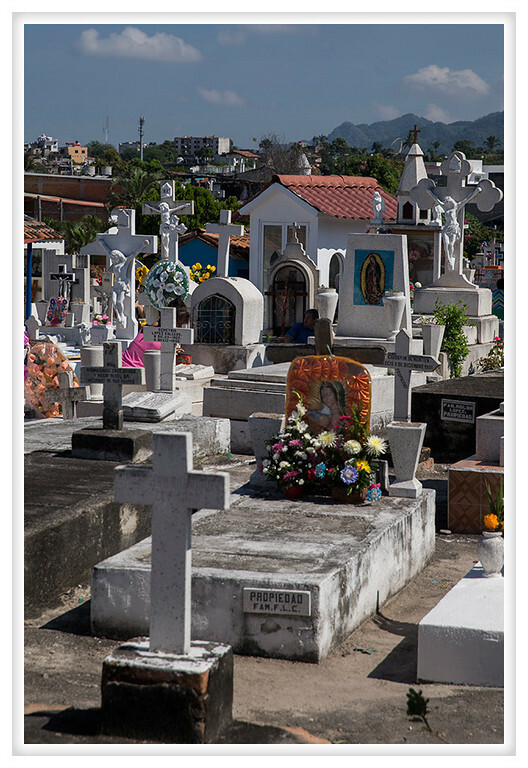 The go to the cemetery to clean and decorate the graves, picnic, and make offerings of food and drink. It was a bit of a work party. People were scrubbing down the concrete, sweeping, painting, and setting out food. Candles were lit, flowers were placed, and decorations soon festooned the graves of the morning crowd. It wasn't too busy as it was still morning but there was a lot of activity and it didn't feel intrusive being there because it seemed like a bit of a party. Sweating we left the cemetery to find our cab driver waiting for us and we told him that we would like to go to lunch. He recommended a place called La Langosta Feliz, the Happy Lobster, which was very good. I had the broiled snapper and managed to eat most of it without too much discomfort. Having eaten our fill we returned to the hotel and found our room almost ready. Most of the afternoon was spent lounging in the air conditioning but we also spent a little time down by the pool. The water seemed a little chilly so we retreated to the hot tub and allowed the bubbles to massage our aching muscles. When we had our fill we returned to our room to get ready for dinner. There was a nice restaurant close by and we all had different soups and split some appetizers to make for a light meal. Tomorrow we're headed off to Guadalajara. Because our cab driver was so nice we asked if he would be willing to take us. He offered us a fair price and we accepted so he will be coming to pick us up tomorrow morning. Since I'm still on the mend it's going to be an early night to be ready for more adventures tomorrow!